The Home Farm Water Treatment Plant (WTP) in Shrewsbury, Massachusetts was originally constructed in 1989. Although the WTP is still fully functional, its treatment capabilities are limited to chemical addition and air strippers for VOC removal, and the plant is capable of treating 6.0 million gallons per day (mgd). Manganese is present at all Home Farm wells, with widely varying levels from a low 0.03 parts per million (ppm) to a high 0.7 ppm. The existing treatment plant sequesters manganese, but does not have the ability to remove it from finished water. Three treatment methodologies were piloted. The first two were greensand and pyrolucite, both commonly implemented catalytic media options for removing manganese and iron. The third was Mangazur®, a new technology. 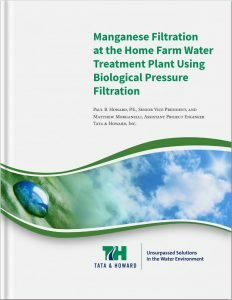 Mangazur® filter media contains the microscopic organism leptothrix ochracea, which consumes manganese and is naturally occurring in groundwater. Through consumption, the microbes oxidize the manganese to a state where it can precipitate onto the media. Unlike other media, Mangazur® does not require regeneration due to the continuous growth of microbes within the filter. Mangazur® technology also does not require chemical addition for pre-oxidation, minimizing the amount of chemical required for the plant. Pilot testing for the biological treatment was performed over five one-week trials. Test parameters included a long shut-down on the filters, adding pre-oxidant, and adjusting pH or dissolved oxygen. The results of the testing indicated that although the Mangazur® does require a correct dissolved oxygen level and pH, it does not require a pre-oxidant, making the only chemical addition necessary for pretreatment potassium hydroxide for pH adjustment. 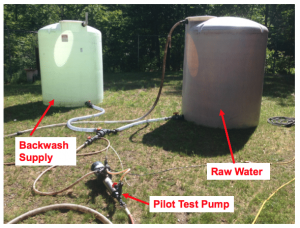 Filter backwash efficiency is also a major benefit of the Mangazur® technology for the Home Farm application. With loading rates twice that of traditional catalytic media and filter runs exceeding 96 hours; the Town would only need to backwash the four filters once every four days rather than eight filters every day, saving a significant amount of water. The backwash flow rate and duration are also significantly lower for Mangazur® filters than for other traditional filter options. The results of the pilot tests indicated that all technologies were viable options to reduce manganese levels below 0.05 ppm; however, the biological treatment was the most efficient and attractive option. Ground breaking on the new WTP took place in July 2017. 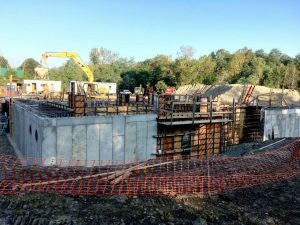 Initially, the Town was only considering constructing filters along with the required backwash holding tanks in a new building and utilizing the chemical feed systems in the existing treatment facility. However, as the project progressed it was determined that it would be more cost effective to replace the existing aging air strippers rather than to continue to rehabilitate them, and eliminate the need to re-pipe the flow since the existing strippers added too much dissolved oxygen prior to the biological units. 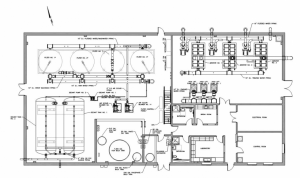 Since the existing chemical feed equipment in the plant is aging and the existing building itself was also in need of rehabilitation, the decision was made to construct an entirely new standalone 7.0 mgd facility. The new facility also contains three deep bubble aerators for VOC removal. 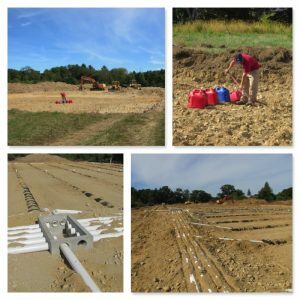 While Mangazur® technology has been approved in one other municipality in Massachusetts, there are few treatment plants in the northeast using this technology, and of those treatment plants, none have a design capacity above 5.0 mgd. Home Farm has a much higher design capacity and will be the largest Mangazur® water treatment plant in the northeast once completed. The Mangazur® filters at Home Farm will have the second highest design capacity in the country, after a 26.0 mgd treatment plant in Lake Havasu City, Arizona. 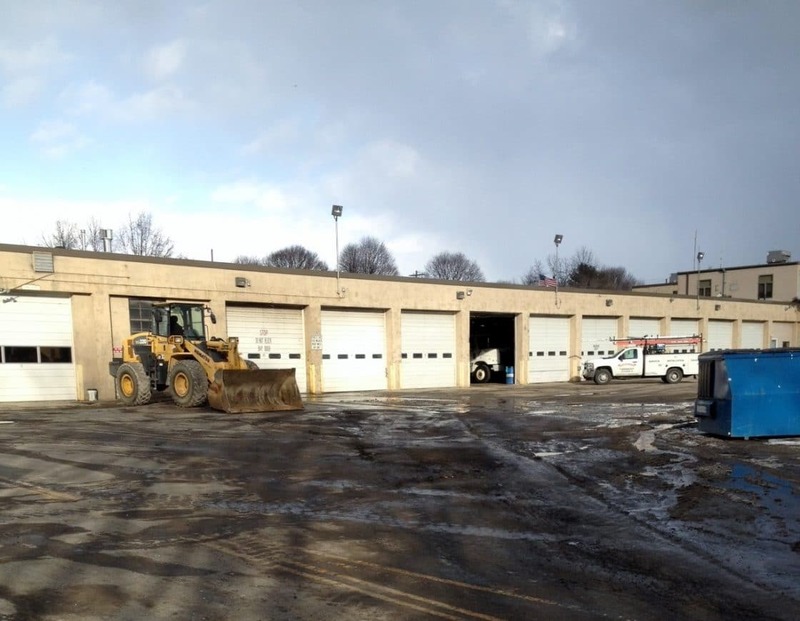 Tata & Howard provided engineering services for Marlborough, MA for a redesign of the Town’s Public Works Facility. 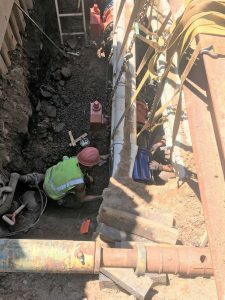 The work included a stormwater management design and program to reduce the contamination of stormwater runoff and prohibit illicit discharges as required by current regulations and as required by the latest draft MS4 permit. 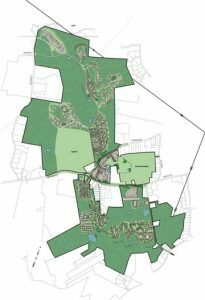 The project also included a proposed site plan showing the proposed drainage improvements for the site including new drainage system infrastructure, stormwater detention and treatment facilities, existing and proposed grade, and all building and features. 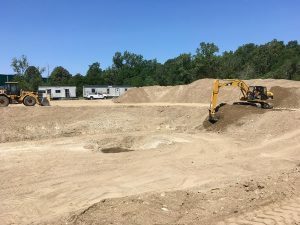 The project also included an erosion control plan and drainage report appropriate for various environmental permitting submissions including and erosion control plan with boundaries of any resource areas and associated buffers. Lastly, Tata & Howard assisted with permitting assistance and obtaining Conservation Commission approval of the project.